6/11/2010: The details of this project are uploaded from my Bellsouth Personal Web Pages. After completion of this project, the vase was packed into a box and put into a closet for consideration, where it stayed (along with alot of other items), for about 7 years. Several months back, I decided it was time to start going through these items. This particular pitcher vase is listed for sale in my Artfire shop under Shabby Chic Rose Floral Pitcher. 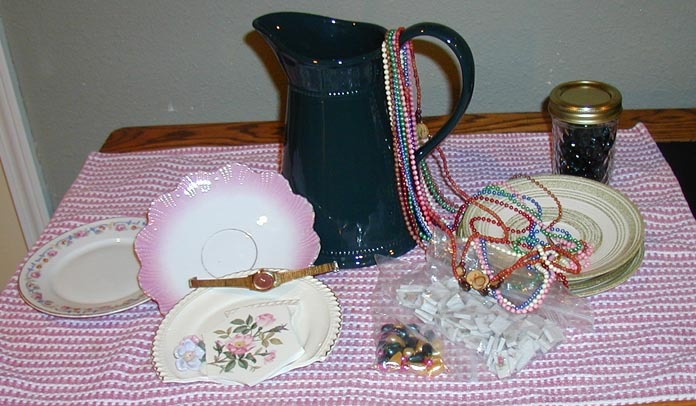 Selected saucers, beads, watch and ceramic flowers to adorn the green water pitcher (vase. It's interesting that just about everything here was found at today's yard sales. That seldom happens, however, when I had it all laid out on the table to take a look, realized it. So, this one just has to be a go. Took right about three hours ... here's everything all chipped, nipped,deburred and ready to roll !!! Have a little extra time today (Beau's wrapped up in the Saint's football game), so went ahead and started applying the tessarae. 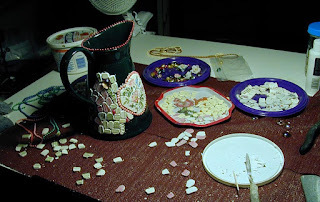 Continued applying tessarae to the water pitcher. Now almost 1/2 done. Finished applying tessarae to water pitcher. Will set aside for a couple of days to allow mastic to thoroughly dry and then will clean and hold for grouting. Okay, this is the last item to grout for September project. Horay!! a) Mixed approx. 1 cup of white grout in a mardis gras cup (because they are disposable). 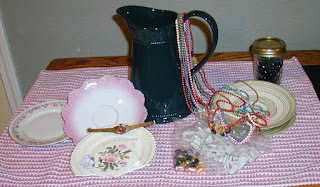 b) Applied to water pitcher with hands, pushing grout between crevices in glass, gems and jewels. Note that by the time I am finished with applying grout to entire pitcher, the grout is already mostly dry. d) With 'barely' damp sponge, brushed dry grout from top of glass. e) Continued removing grout in layers until water pither is clean. 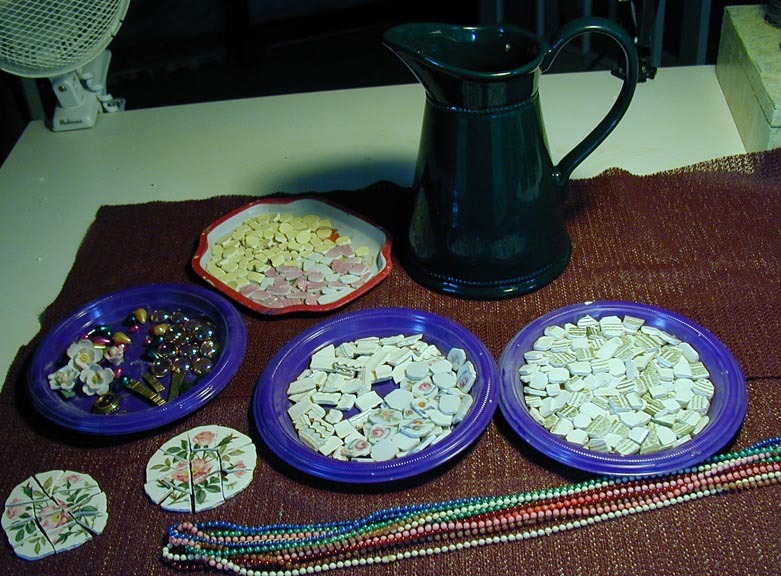 I did not like the way the beads at the top of the vase looked when grout was applied .... so, pulled them off and cleaned rim. Will let sit until after dinner, then will buff with soft clean cloth to remove any haze build up. Applied two heavy coats of Impregnator (stainl sealer) to the water pitcher to seal grout. Waited approx. 10 minutes and wiped off any remaining liquid from the glass and gems. (Impregnator is a clear liquid, like water, but with a tremendous smell. If left on the glass to completely dry, it will leave tremendous water spots). This project is completed. Sometime in the next day, I'll come up with a name for her (usually this happens well before now) and take pictures.